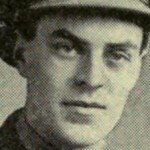 CWGC: “Born at Coulsdon, Surrey. 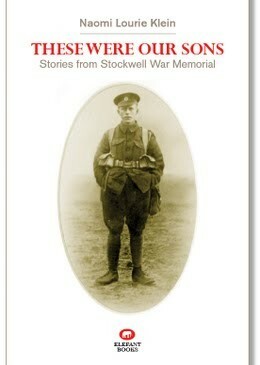 Son of David John Gingell George and Emily George, of 76, Southview Rd., Southwick, Sussex. 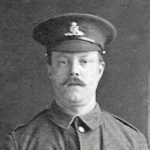 Benjamin James George went missing on 1 July 1916, the first day of the Battle of the Somme. His status changed to “Killed in action” on two weeks later. However, this was wrong. 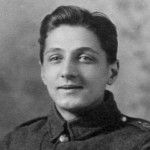 He was, in fact, a prisoner of war in Germany and he was suffering from gunshot wounds to the left side of the chest and pneumonia. He died in the hospital of a German prisoner of war camp (Gefangener Lager Lazarett) at Minden, a city west of Hannover and over 600 kilometres from the Front. A document translated from the German in George’s file (transmitted to the War Office through the Red Cross) states that he was visited by a clergyman adn buried in the French Cemetery at Minderheide, Grave 145, and gives his precise time of death – 12.30am. His effects were sent to his family: French dictionary, torch, holdall, notebook, steel mirror. These items were presumably in his dugout. It is unlikely he would have had them with him when captured. The other details we have on George are that he was 5 feet 6 inches, with a 34½ inch chest (which he could expand by 2½ inches). He weighed just over 9½ stone. There were small moles on the left side of his neck. He had fair hair. He gave his address as 46 Hemberton Street, and his occupation as salesman. He was 25 years and 9 months old and was born in Thornton Heath. He enlisted at Lambeth. 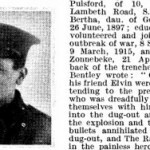 He was hospitalised at Tidworth, Hampshire for 3½ weeks in October 1915 with impetigo on the chin. Impetigo, a highly contagious skin disease, was common in soldiers, although rarely reported in the field, as soldiers would wait until it became infected before seeking health. An article in the British Medical Journal of 2 February 1918 claimed that of 1800 military patients in one of the London General Hospitals over 1400 had the condition. Treatment was long and tedious. 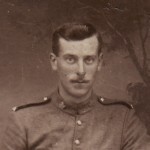 Claude William George, 30, was designated head of the household. He worked as a sorter for the G.P.O. (General Post Office). Born in High Wycombe. Buckinghamshire. Elsie Annie George, 25, had no employment. She was born in Hammersmith, west London. 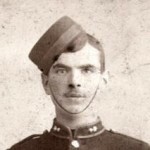 John George, 23, was a railway porter. He was born in Hammersmith. Benjamin James George, 21, was a shop assistant in the book trade. He was born in Thornton Heath, Surrey. Emily White, 25, was a cashier in a restaurant. She was born in the City of London. 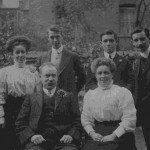 Their father was a police sergeant (1901 census).